These conceptual sketch is a quick visualization exercise to be include in a proposal. 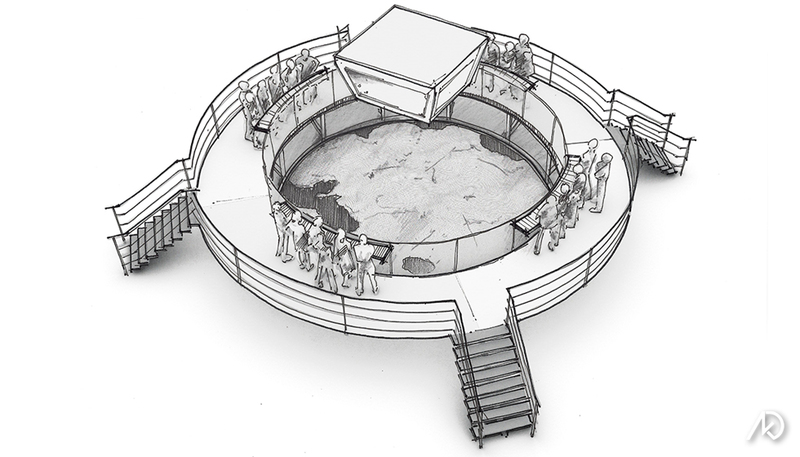 The sketch shows an interactive game-show set. Basically four teams will compete against each other in order to raise awareness to GE’s many rail distribution possibilities. information and interactively strategize against their rivals. The progress and scoring will be documented on the hanging scoreboard. The sketch was created by sketching-over a 3d illustration, or a white model. I quickly designed the set in 3d in order to get the scale correct; then I used it as an underlay to sketch over.